I must be going on my umpteenth utensil holder in my kitchen. Over the years, it's been a varietable roller coaster ride for my meat fork and spatula as my taste in styles have changed. My utensils have enjoyed nesting places from sleek and sophisticated stainless steel cylinders to quaint hand thrown pottery crocks. 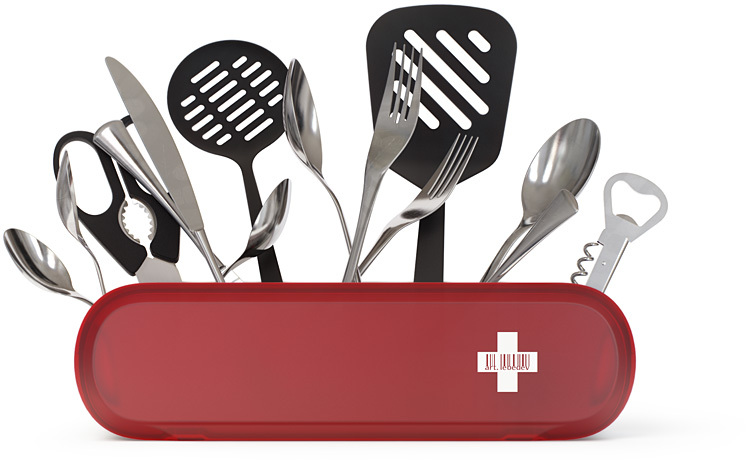 Time for a change again - I think they might enjoy this one - funky whimsical and - just like the real Swiss Army Knife, the Swissarmius is useful and functional as well. 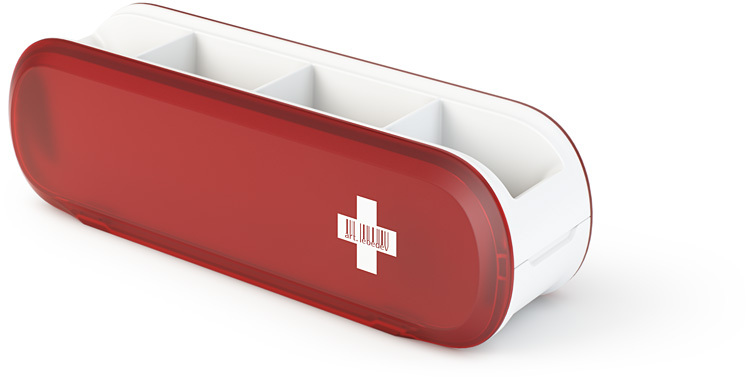 Swissarmius has four sections to hold everything! 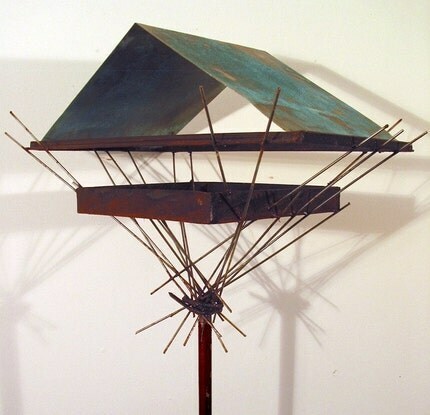 Leave it to Art.Lebedev Studio. JUST COOL! Poppy Petunia has the worst breath lately!! It smells like dead fish and no matter what product I try, it just doesn't work. On top of that she just picked up another problem or should I say obsession -constantly licking her front legs. She needs relief and we need refuge from her dreaded fish breath. I switched her diet to a new very expensive dog food, (she doesn't like it either- of course! ) and even that didn't help. So am I happy that I just found a great website that may be the solution for her problems. It asks you questions about your dog and then custom tailors a program of health supplements and products for him / her. It's like taking a trip to the vet without leaving the comfort of your home. Poppy definitely likes that! I went to their solutions center , answered all their questions and Dinovite recommended some great products, from supplements, to treats and shampoos. I learned a lot about how our pets metabolize their food which in fact can be the root cause of allergies, shedding and even bad breath like Poppy has. Did you know that commercial dog food is cooked at extremely high temperatures which actually destroys many of the delicate nutrients your dog needs to be healthy. Basically, our pets walk around in state of semi malnourishment, missing things like vitamins, minerals, digestive enzymes, beneficial bacteria and essential fatty acids. 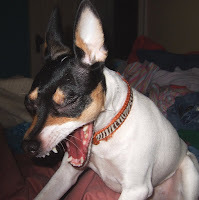 Excessive shedding, itchy skin and stinky breath and fur are all signs of a nutritional deficiency and Dinovite fills in those lost nutirent "gaps" with it's specially formulated supplements. So how's your dog smelling these days? If your answer is "not too good" then you really need to check out Dinovite for a customized solution to your doggy odor problem. Babies are just darn cute! Aren't they? Even when they look like this. We all know that ice cream isn't just chocolate, strawberry and vanilla anymore. Over the years the frozen confection that we all love has elevated itself to gourmet ranks and just about every flavor you can imagine has been whipped up. Even bacon! Check out these and more amazingly flavored ice creams at Womans Day. They're JUST COOL! Just part of the brilliant ad campaign that Sukle Advertising and Design created to get the word out to save water. The Denver based campaign, whose baseline is “Keep our Rivers flowing, use only what you need,” transforms grocery store checkout belts into flowing rivers. Then, to really get the message across, the bars that customers use to separate the orders bear the campaign’s slogan. JUST COOL advertising, I think! 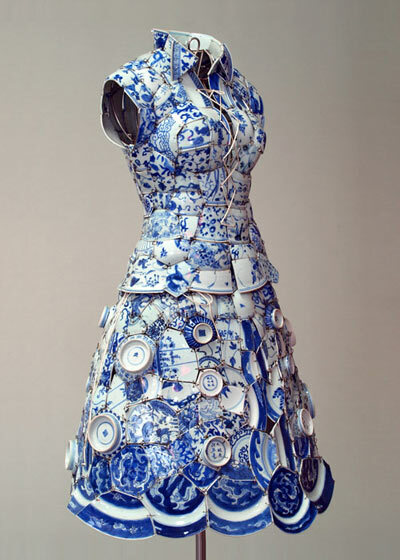 Li Xiaofeng turns a popular collectible (chinese blue and white pottery) into the most unconventional creation ever. His pottery dresses, ceramic suits and funky shard fashions are JUST COOL! 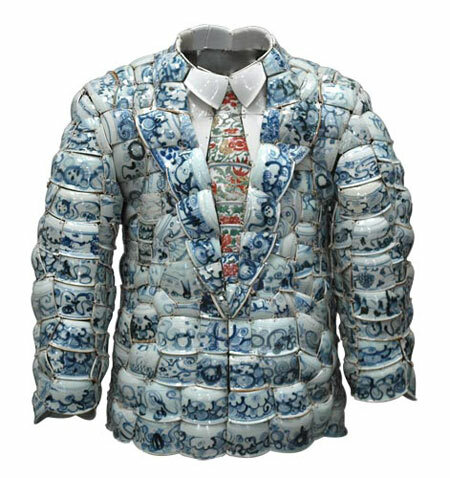 Walk into his studio and you will be surrounded by bins of pottery pieces sorted by date, color and shape.He creates this clothing with ceramic shards from the song, ming, yuan and qing dynasties, which are sewn together on a leather undergarment. Hardwear that is JUST COOL! fashion :: up up and away! Balloons aren't just for children's parties anymore. Thanks to the creative genius of designer Daisy Balloon, blowup latex has elevated itself to the ranks of designer couture. Wearing one of her creations I imagine, would feel quite .... uplifting! I especially like that red and white flower and lady bug one up there. It's JUST COOL! What will they think of next? Modern packaging for today's pet poop is what! Don't get caught out on your walk with Rover without a striking and cleverly designed canister of "Olives Poop Bags". Really, they are attractive - I love the Nate Williams zany artwork scribbled all over them and the company that produces them has thought of everything because they are eco friendly and bio degradable as well. "Olive's biodegradable poop bags are made naturally from GMO-free corn starch and vegetable oil, are certified 100% biodegradable and compost in as little as 40 days. They come in two sizes - Unisex (small) and Super Poop (large) - and are available online at www.olivegreendog.com." Poppy Petunia will take a few cans of the Unisex, please. Cuz these poop bags are JUST COOL! 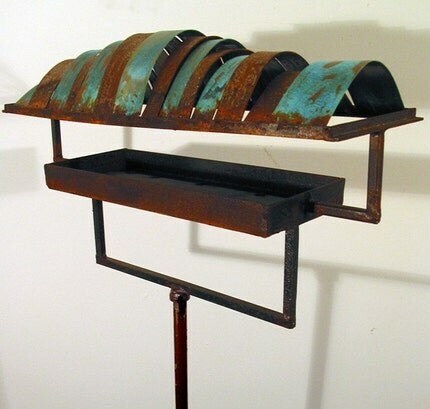 Fellow Etsian, Joe Papendick makes these cool sculptural bird feeders out of hand forged steel and other metals.He then applies a chemical to the metal to bring out it's natural aged patina and color. I'm sure all the birds would be a twitter if I planted one of these in my garden. I know I would! 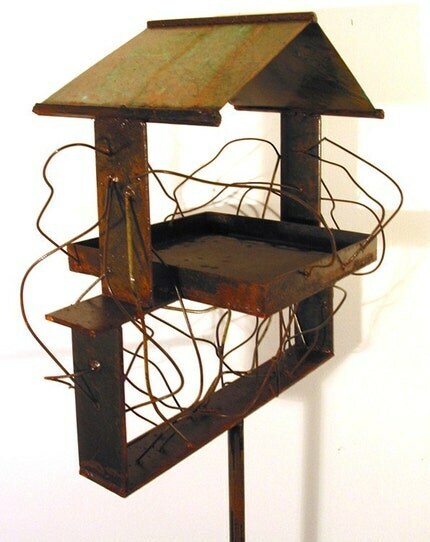 Art for the birds - it's JUST COOL! Simone Georgette ... "Picked up this glass fish bowl from a second hand store for $5.00. What on earth was I going to do with it? I had no intention of using it for it's original purpose. So here's the equation. 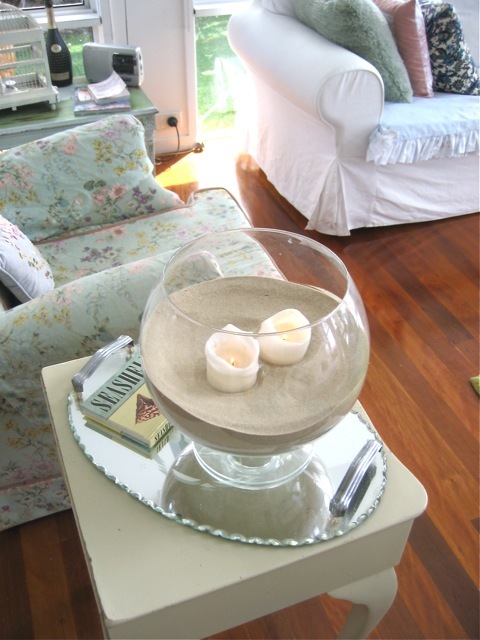 Sand from my favourite beach + 2 candles = FAB atmosphere at night..."